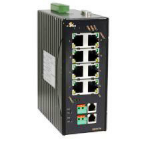 The Data Connect DCE/ 2178MDEE Industrial Grade Multi Drop Ethernet Extender is an one 8-port 10/100Base-TX switch and two 2-wire Ethernet ports used to extend Ethernet up to 300 meters (984 feet) at 50Mbps over two existing voice grade copper wires. A simple single switch allows for a choice between local or remote setting. Thus select local for side A of the circuit and select remote for side B of the circuit. The DCE/2178MDEE is fully managed via SNMP, Web Browser, Telnet or Console port and is designed to integrate 10/100 Mbps networks into VDSL backbone. The DCE/2178MDEE supports advance features such as 802.1Q VLAN, MAC-based Trunking, IPMulticast IGMP Snooping, Rapid Spanning Tree for Redundancy, QOS foe Priority Queuing, and Port Mirroring. The DCE/2178MDEE functions at temperatures ranging from -40 Degrees Celsius to 75 Degrees Celsius (-40 Degrees Fahrenheit to 167 Degrees Fahrenheit) and tested for functional operation at -40 Degrees Celsius to 85 Degrees Celsius (-40 Degrees Fahrenheit to 185 Degrees Fahrenheit). The DCE/2178MDEE complies with NEMA TS1 & TS2 that meets with Environmental requirements for Traffic Control equipment and complies with IEC61000-6-2 EMC, a Generic Standard Immunity for the industrial environment.